Most of us who work on larger systems have probably developed, or worked on a project subsystem that contains core functionality that is shared across multiple solutions. Perhaps you have a utility library for user security, or a library of extension methods that make your development life easier. A project I am currently working on has one of these shared utility libraries. We use a common library in multiple projects and the way we share it is by linking the actual source repositories across projects and including the project files within multiple solution files. Well today it occurred to me that this might be a bad idea. While it certainly makes the developer’s life easier, I think it can open you to more trouble than you gain from the convenience. I would like to make the case that that utility should be its own CI project that is maintained independently from its consuming solutions. If you need additional functionality, you should have to go make your changes, push through a “production” build process, then update your references to a compiled DLL. This strategy will ensure that changes in the library for one dependency don’t have unforeseen consequences in another dependency. Are you using email in your application but are not sure how to test the email functionality? Simply add the following section to your configuration file and any usages of the .NET framework email will “deliver” your messages as text files in the specified directory. Now your unit tests can read the file contents an assert the email was formed correctly. Note that your application needs permissions to write to the pickupDirectoryLocation specified. I simply granted full access to that directory for all users on my development machine. Erwin Maulana Saputra has a great blog post if you are Windows 7 64bit user having trouble trying to get the Android SDK to recognize your JDK installation. I am currently working on a Silverlight application where one of the UI elements is “pinned” to the edges in such a way that when the user resizes their browser, the element will scale to fill the space. The trick to its scale, however is that I want the proportions to remain the same. In my proof of concept, this element was a simple 4:3 rectangle. In order to determine how to resize it, I would calculate the percentage of scaling needed to fill the space based on the height of my rectangle and the scaling need to fill the space based on the width. I would use the smaller of the two percentages to ensure that the resized rectangle would always fit in both height and width. When I went to implement the actual application, I had reworked the UI so that the rectangle (which represents a photo snapshot) was rotated by 15 degrees to give it a scrapbook type look. For most scenarios, my math held relatively well, however in some resizing, the lower left corner or upper right corners would scale off the canvas. At first I didn’t realize what had changed, but then it occurred to me that the “true” heights and widths of my scaled rectangle would technically fit on the canvas, but my rectangle was now rotated, which sometimes caused the corners to rotate off the screen. Today I sat down and created some methods that would determine the bounding box of my rotated rectangle. Now I can use the same math but with the bounding rectangle instead of the rotated rectangle. This ensures my photo rectangle will always fit on screen. If you remember your algebra (I didn’t, I had to look it up here) you remember that Sin = Opposite/Hypotenuse. This is pretty much all we need if we consider the x1, x2, y1, and y2 values we need to be “opposites” and the height and width of our rectangle to be the hypotenuse. So for x1 we use the formula SIN(90-degrees) * r.Height. We use 90 – degrees because the triangle with r.Height as our hypotenuse and x1 as our opposite has an angle of 90 minus the degree of rotation of our rectangle. 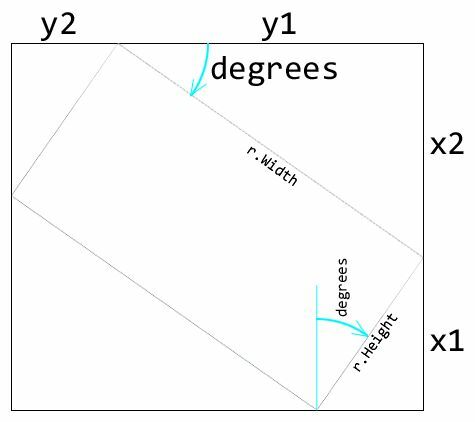 For x2 we can use SIN(degrees) * r.Width. For y1 we use SIN(90-degrees) * r.Width. And finally for y2, SIN(degrees) * r.Height. That seems simple enough. But in C# there is a small wrinkle. The Math.Sin() method takes radians as a parameter instead of the degrees we use for the rotation transform. In order to convert our degrees to radians, we multiply by a coefficient of 0.0174532925. I also added some logic so that I can simply pass my methods an abstract FrameworkElement and determine if the element has a rotation transform applied. If not the plain height and width of the element will do.